Having beaten Sweden 2:0 in the quarter-finals of the 2018 FIFA World Cup in Russia, England qualified for the semi-finals at a World Cup for the first time since 1990. The success of their own team isn’t the only reason for English football fans to be proud though: with 60 of 64 matches played, the English Premier League has lived up to its name as the strongest league in world football. Not only does the Premier League have the most players left in the tournament, Premier League players have also proven most dangerous in front of goal throughout the past three and a half weeks. 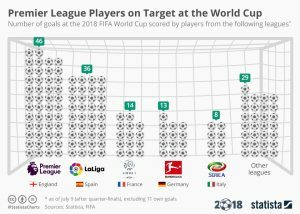 46 of the 157 goals scored at the World Cup so far have been scored by Premier League players, with Spain’s La Liga the only serious contender at 36 goals.